• Happy customers: Foster’s Valda and John Lanigan, with South Gippsland Hospital’s acting Home Care Packages Program Manager Melissa Henwood. FOR Foster’s John and Valda Lanigan it was an easy decision. 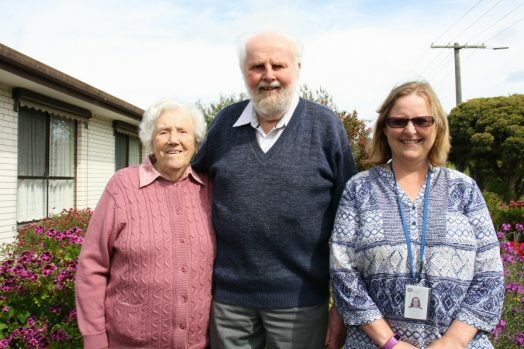 Once the couple discovered South Gippsland Hospital was offering Home Care Packages, the only question was, how quickly can we swap? “I always preach to people that I believe in supporting local,” John said. “I’d definitely recommend the service to other people,” Valda said. John said the couple was currently accessing house cleaning and gardening services. “It’s taking some of the heavy work off us,” he said. Valda said having some extra help in the garden and stopped her injuring herself by pulling up weeds and the like. The package also gives her access to a diabetes nurse and osteopath. “The osteopath worked on my shoulder. He’s fantastic, that man. He’s practically fixed my back too,” she said. South Gippsland Hospital’s acting Home Care Packages Program Manager Melissa Henwood said the federally funded home care packages were a means of keeping elderly people from becoming patients. “At the end of the day, too, most people want to stay at home. The focus of the packages is helping people stay at home and live as independently as possible,” she said. “The kind of assistance on offer varies greatly from client to client. It can be anything, from showering assistance; domestic cleaning; even outside home maintenance, like window cleaning, gutter cleaning, lawn mowing, pruning trees and all the other sorts of things you may not be able to do anymore. Melissa said South Gippsland Hospital has been delivering home care packages to the Corner Inlet region since May this year as part of its “seamless” health care services for elderly people. “If we can support people to stay at home, I think their quality of life is improved and they have much greater control over their own destinies,” she said. “We’re also looking at doing more innovative things, like having a physio assessment and having an exercise plan with light weights, so older people can keep fit and strong. That’s one of the things we’re going to introducing in the next six months for both new clients and those who already have a home care package with the hospital,” she said. To learn more about the home care packages call Melissa on 0447 253 792. Prospective clients must first contact My Aged Care on 1800 200 422 to request an assessment. You will then be contacted by the Aged Care Assessment Service (ACAS), who will make an appointment. An assessment service member will come out and conduct an assessment, whereupon you will be placed in the national queue for a home care package. Sometime later you will receive an initial notification of approval. Next you will be assigned a home care package, whereupon you are required to seek out a provider through My Aged Care. South Gippsland Hospital is one amongst a host of options in the Corner Inlet region. There are four levels of packages available, attracting different levels of funding, depending on needs.